In this 228-page biography, Richard O. Reisem reveals the noble heart and remarkable accomplishments of Myron Holley. Reisem tells Myron Holley’s story in the context of the momentous historical events and movements that shaped his life, including the War of 1812, the building of the Erie Canal, and the struggle to abolish slavery. The author crafts a comprehensive portrait of the profound influence that this visionary man exerted, changing the course of history in New York State and indeed the nation. 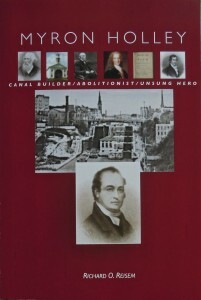 Among Holley’s many achievements, he served as the Superintendent of Construction of the Erie Canal and founded the first Horticultural Society in Western New York, the First Unitarian Church in Rochester, and the anti-slavery Liberty Party. Reisem’s telling of Holley’s remarkable life includes abundant background information about his ancestors and descendants and the historical events of his time. Excerpts from personal letters reveal the man’s heart and intellect, and more than 70 illustrations enrich the story. Richard O. Reisem has written 15 books since retiring from Eastman Kodak’s Communications and Public Affairs. His Mount Hope Cemetery books include: Gravestones in Mount Hope Cemetery, Frederick Douglass and the Underground Railroad, Buried Treasures in Mount Hope Cemetery, and Mount Hope: America’s First Municipal Victorian Cemetery. Other cemetery books are: Forest Lawn Cemetery: Buffalo History Preserved, A Field Guide to Forest Lawn Cemetery, and Blue Sky Mausoleum of Frank Lloyd Wright. Other books include: Historic Photos of New York State, Historic New York—Architectural Journeys in the Empire State, Erie Canal Legacy—Architectural Treasures of the Empire State, Classic Buffalo—A Heritage of Distinguished Architecture, and 200 Years of Rochester Architecture and Gardens. He was graduated from Iowa State University with major studies in architecture and journalism—which included editor of the university newspaper, Iowa State Daily. His 31-year career at Eastman Kodak included speechwriter for six of the company’s CEOs. He is an honorary trustee of The Landmark Society of Western New York, vice-president of the Friends of Mount Hope Cemetery, and former trustee of the Rochester Historical Society. For 16 years, he served on the Rochester Preservation Board, and was chair for four years.